Inspired by my daughter who was playing with soap bubbles, I one day got the idea to take photographs of the surface of soap bubbles. For this purpose I filled a big dark frying pan with water and put some dishwashing liquid in it. I mounted my little digicam on a clamp pod (figure 2) and aligned it roughly with the pan. Then I blew some bubbles into the water using a drinking straw. Now I aligned the camera exactly with the vernier adjustment of the clamp pod and started photographing. Already the first pictures turned out well, and a short while later I had made a considerable amount of pictures. I soon noticed a remarkably large variety in the positioning of the different colours on the soap bubbles. At first, the distribution of colours on the bubbles looked like a piece of abstract art, but later the colours arranged to parallel stripes, similar to a rainbow. The physical reason for these colours is the so called two-beam interference. This is remarkably well explained at http://www.itp.uni-hannover.de/~zawischa/ITP/zweistrahl.html (German) and http://www.itp.uni-hannover.de/~zawischa/ITP/twobeams.html (English). The main statement in this explanation is that the colours depend directly from the optical length of way (and so from the thickness) inside the the soap layer. This is an explanation as well for the black “holes” at the highest point of the bubbles, as also for the colourful rings below these “holes”. 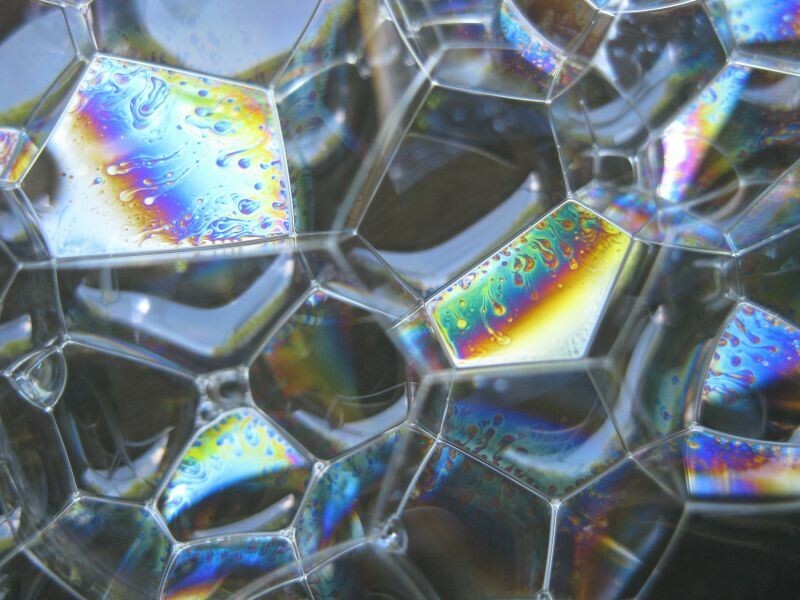 The colourful flaws, which can be seen especially on “fresh” bubbles, are areas of different thickness of the soap layer, which are (still) positioned irregularly. 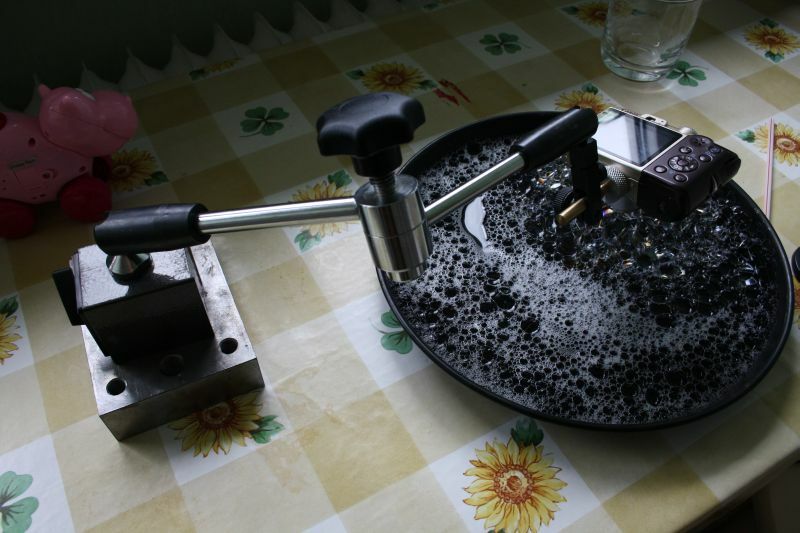 Following the force of gravity, they slowly flow downwards causing the soap layer to be thinner at the top and thicker at the bottom of the bubbles. The constantly the thickness of the soap layer increases from the top to the bottom of the bubbles, the more regularly is the positioning of the colourful rings. 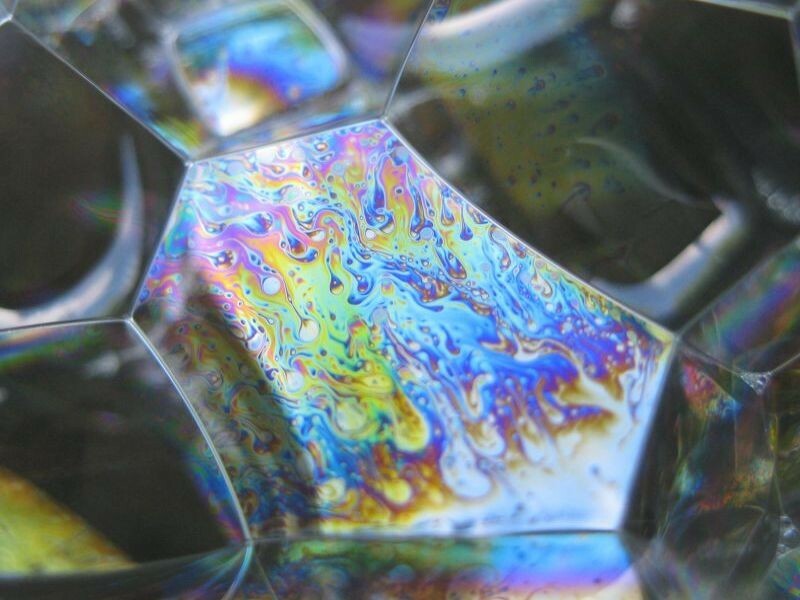 The Picture above show a detail on the surface of a soap bubble. Figure 2: Camera mounted on a c-clamp. The distance between the camera lens and the soap surface is here about 4 cms. 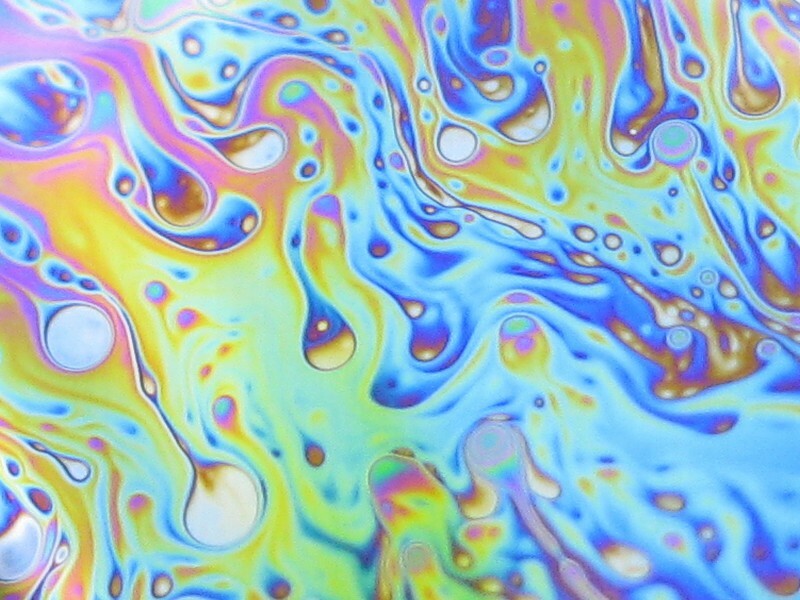 Figure 3: Abstract play of colours on the surface of fresh soap bubbles. Figure 4: The lesser the flaws in the soap layers are, the more regular is the increase of the thickness of the soap layer towards the bottom of the bubbles, and so is the play of colours. 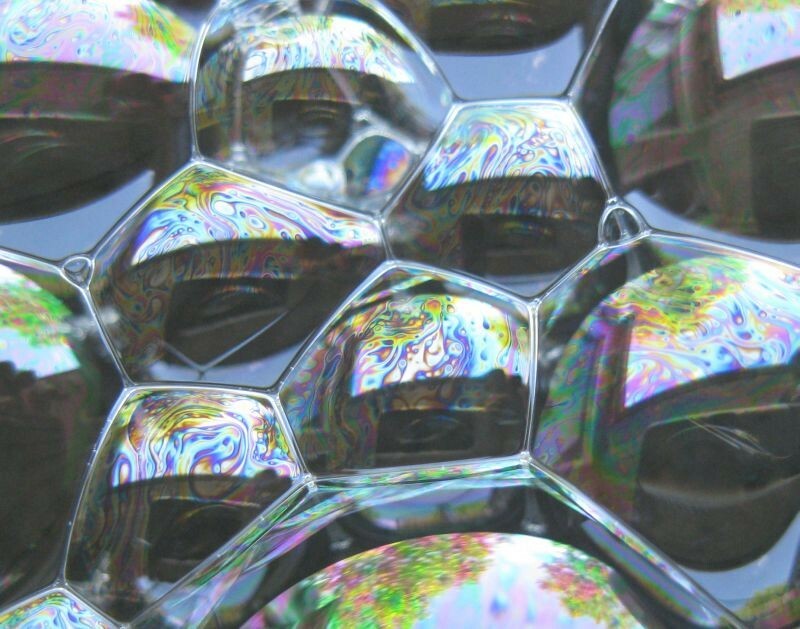 The spotted dark areas on top of the bubbles indicate that the bubbles are about to burst. 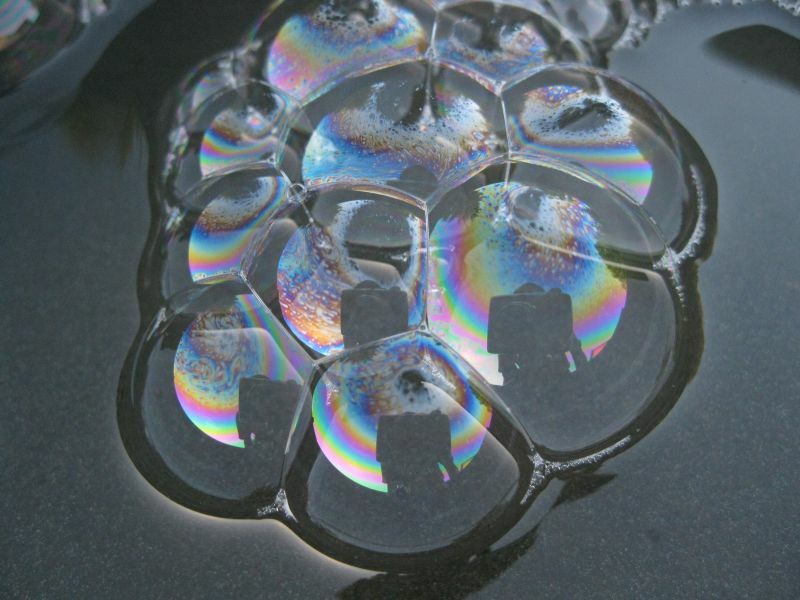 Posted on May 27, 2011, in miscellaneous phenomena, observations and tagged interferences, Soap Bubble colours. Bookmark the permalink. 1 Comment. 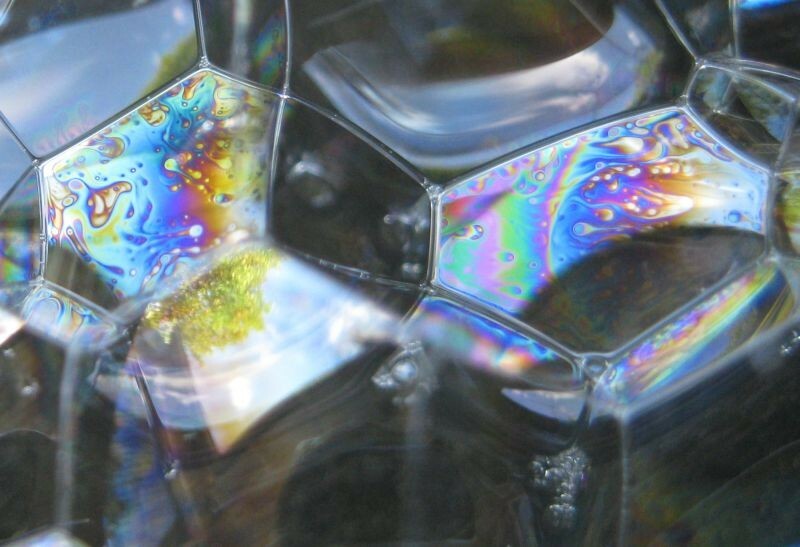 Thank you for the great blog on “Interference Phenomena on Soap Bubble Surface”.